Jimmy is our In-Country Director for Croix-des-Bouquets, Haiti. He uses his local knowledge to select where to build homes, recruit skilled workers, and keep our construction efforts running smoothly. A Haitian himself, he is familiar with the language, culture, and struggles of Haiti, and is an integral part of our team. Zuze is our In-Country Director in El Salvador. She and her daughters met Michael Bonderer in 2000, and the family quickly moved to El Salvador, the most densely populated country in the Americas. There they built over 500 homes around the country, including a 149-house community in an area of San Salvador plagued with violence. Zuze organizes labor and materials, tracks finances, works with families in the community, and interviews prospective beneficiaries. Michael Bonderer worked as Executive Director of Homes from the Heart for over 15 years, ever since the devastating earthquakes hit El Salvador in 2001. Michael was a veteran of the United States Marine Corps and a former entrepreneur from Kansas City, Missouri. Besides being in the construction business for over 25 years, Michael owned various restaurants and an elevator maintenance company. In 2000, Michael was in search of redemption. So, he ventured to Guatemala with a truckload of tools and his dog Jake. Once there, he began working with neglected children on the streets. Then, he met Zuze and moved to El Salvador. The rest is history. Read more about his legacy here. 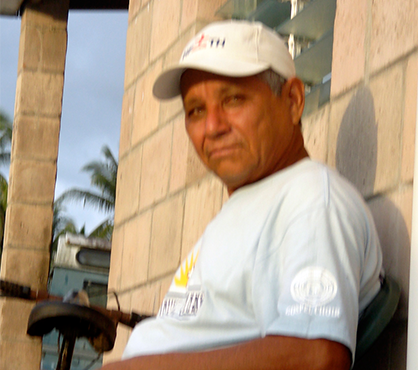 Homes from the Heart fondly remembers Geronimo Alberto Mantano, Director of Volunteer Services and an invaluable member of our team and family. "Homes from the Heart Remembers Board Member, Rick Dye" Read our blog post in memoriam of Rick here. In memoriam of Neal Turkington, Homes from the Heart Volunteer and Lieutenant from the 1st Battalion, The Royal Gurkha Rifles, killed in Afghanistan.